This article by Tom Weis is re-posted from EcoWatch. Edtor’s Note: While we agree with much of what this article states, we also do believe that the President really has a choice, because of the systems of power in this country and how they function. When politicians make the “right choice” it is only because the public has forced their hand to do so. Stopping the Keystone XL Pipeline will happen because of the growing public resistance to it. Note to President Obama: You approved it. You own it. Since then, TransCanada has constructed roughly one-third of the 485-mile southern leg (if not for fierce push back by a few determined landowners and the courageous efforts of Tar Sands Blockade, it would be more). I could go on … this is sick stuff. All this is occurring despite the fact that countless landowners in six Great Plains states whose private property the pipeline would cross don’t want it. Native American tribes whose treaty lands the pipeline would desecrate don’t want it. Even the President’s own U.S. Environmental Protection Agency administrator, Lisa Jackson, reportedly resigned in large part because of it. So why does President Obama want it so badly? It can’t be jobs. Obama’s Keystone XL risks destroying more jobs than it creates. It can’t be energy independence. Obama’s Keystone XL is being built as an export pipeline for Canada to sell its dirty oil to foreign markets. It can’t be cheaper gas. 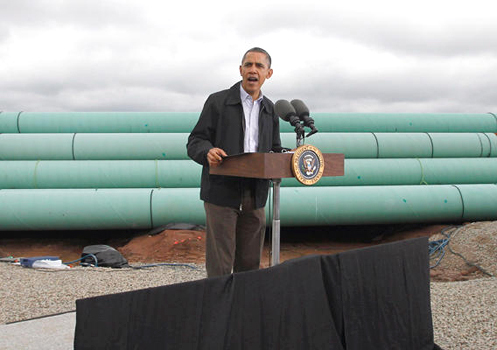 Obama’s Keystone XL portends higher, not lower, gas prices for the Midwest and Rockies. It can’t be public health. Obama’s Keystone XL threatens to further poison the air of people living near tar sands oil refineries. It can’t be economic security. Obama’s Keystone XL imperils U.S. aquifers and waterways and the local economies they support. It can’t be national security. Twenty prominent scientists have warned of the climate impacts of Obama’s Keystone XL, with an elite Military Advisory Board declaring climate change a threat to our national security. There’s still a way out of this mess, but the window of opportunity is rapidly closing on this presidency. The minute we see President Obama use the powers of his presidency to end this immoral assault on America is the day we’ll know he is ready to deal with a climate spiraling out of control on his watch. Immediately halting construction of Keystone XL’s southern leg. Rejecting outright TransCanada’s permit to build the northern leg. Using the bully pulpit of the presidency to begin a long overdue adult national conversation about how we’re going to solve the gravest challenge of our time. The hour is late, but it is not too late for President Obama to trade out his dead-end “all of the above” energy strategy for a life-affirming green industrial revolution. A principled leader would use the next four years to do what is hard: stand up and fight like hell for the future of life on Earth—earning the eternal gratitude of generations to come. A compromised politician would do what is easy: cave into the fossil fuel lobby and sacrifice the future of our children and grandchildren on the rotting altar of corporate greed. If President Barack Obama continues down the dangerous path he is currently on, he will go down in history as the pipeline president who knew the horrors of the climate peril we face, but lacked the moral courage to act.